A while back I read a book called Betrayal, Murder, and Greed by Pam Phree and Mike Beakley. It’s a non-fiction account of the bail bond and bounty hunter business and it all takes place in and around Tacoma. Since then I’ve had the chance to meet with the authors personally and I was happy when Pam agreed to be part of 5 Question Friday this week. 1. What is Betrayal, Murder and Greed? Betrayal, Murder and Greed—those three words—sums up what our book is all about. There is a lot of filth, dirt and corruption in the world, in every industry including the Bail Bond Business. My co-author and Bounty Hunter, Mike Beakley and I, the Bail Agent, opened our personal case files to reveal our most interesting and dangerous cases. Since the book literally details true stories of Betrayal, Murder and Greed, that seemed an appropriate title. 2. What are its ties to Tacoma? Both Mike and I were born and raised in Tacoma. Mike was a Tacoma Police Officer for sixteen years—on the SWAT team and working undercover narcotics before the shootout that ended his police career. Afterward, he met me and became a Bounty Hunter. For over twenty years, Mike and I have worked in Tacoma for various Bail Bond Companies. Many of the stories in the book happened in and around Tacoma. Our hometown is liberally featured throughout the book. 3. Do you think crime is different in the Pacific Northwest and if so, how? Sadly, crime is everywhere in every town, in every city. I wish I could say we’re safer living in the Pacific Northwest but that wouldn’t necessarily be true. Every city has its own set of challenges. I’d venture to say we’re no safer—but certainly not more dangerous—than any other city in the US. Fortunately, we have dedicated, hard-working police officers like Paul Pastor and prosecutors such as Mark Lindquist who are making a real dent in cleaning up the crime in our area. 4. What’s coming up in the next book? 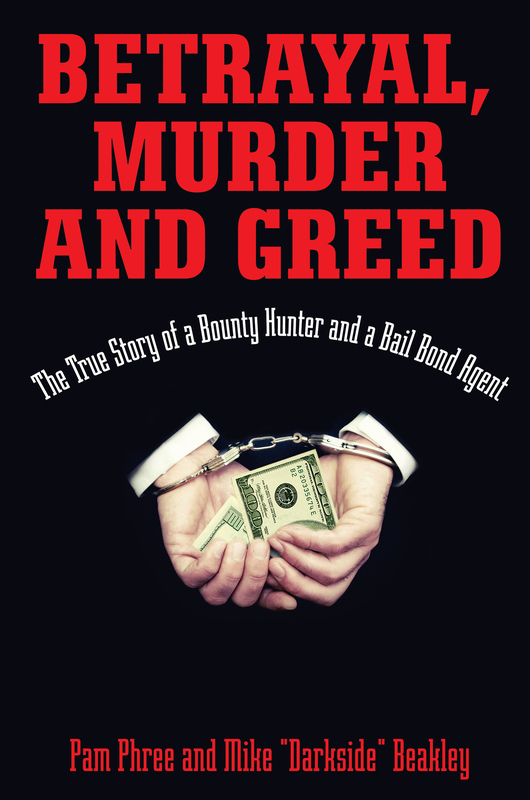 Betrayal, Murder and Greed: The True Story of a Bounty Hunter and a Bail Bond Agent, our first book, introduces Mike and myself. Our personal story of how we got into the Bail Bond Industry is told as well as illuminating some of the cases we’ve worked on throughout the years. Book 2, tentatively titled, “Shocking True Stories by a Bounty Hunter and a Bail Bond Agent”, tells the stories of our clients; those I’ve bailed and those Mike have had to chase after they jumped bail. The reader is introduced to characters from all walks of life, hears their own personal stories of Betrayal, Murder and Greed and over the course of twenty years, sees where life ultimately takes them. Some live, some die. Since these are true stories, the endings aren’t predictable. Readers will be surprised to learn who survives and who doesn’t. 5. What’s been the best experience since releasing the book? Mike and I have been privileged to appear on television, film a book trailer and meet a lot of interesting radio personalities that otherwise we wouldn’t have met. But hands down, the best experience we’ve had since releasing the book is meeting other writers/authors in our area. There are a lot of interesting, creative, talented people in the writing business—such as yourself, Jack, that when we get together and talk ‘shop’, is exhilarating. That’s one of the reasons Mike and I jump at the chance to meet other writers at every opportunity. It helps get our own creative juices’ flowing with ideas for subsequent books. Once again, I want to thank Pam for stepping in at the last minute to do this. I’ve been incredibly sick during the last week (thus the lack of updates) and I only got the questions to her this morning so I really appreciate her help. Mike and Pam are selling and signing their book at the Tacoma Mall this Saturday, April 16, 2011 from 11am – 4pm outside Macy’s. If you’re in the area, you should drop by and say hello.